To my mother-in-law! While the kids and I were in New York City with friends so we were not able to celebrate with her on the day itself, we brought cupcakes to our Fake Easter celebration so we could all sing “Happy Birthday” to her. You can’t run from the passage of time! You’re probably puzzling now over what the heck “Fake Easter” is. It’s become a sort of tradition in our families that since our schedules often conflict (whether it’s because my grandparents aren’t home from Florida yet, my aunt has to work, my sister-in-law is on a cruise…), getting together with the whole family on Easter itself isn’t always possible. Fake Easter evolved from this–necessity is the mother of invention, after all. My mother and/or mother-in-law select a more schedule-friendly day and we gather the whole family then, in the name of Easter. Fake Easter. As it turned out this year, real Easter didn’t work for anyone. My side of the family involves working with about 30 people’s lives, so it’s always more difficult to find a date that jives. This time around, that will be next Sunday. My in-laws had their party yesterday, minus my sister- and brother-in-law (who are on a cruise this year–lucky them!). Where does that leave us for real Easter? Just the four of us, home, enjoying a quiet Sunday. Much-needed after this Friday and Saturday anyway. 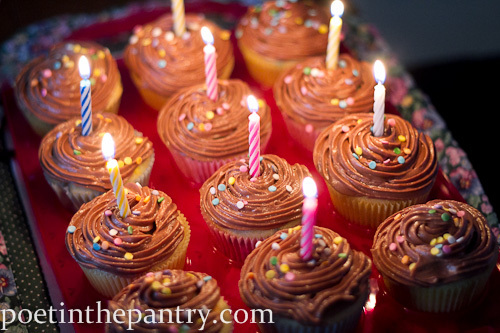 And with leftover cupcakes from my mother-in-law’s birthday–for a happy re-birth day, too! The frosting seemed off initially. Part of it was most definitely my impatience–I had planned on using my mom’s “secret” mocha frosting recipe but forgot that it calls for raw egg and shortening. At the last minute, I had to come up with a mocha substitute that didn’t require a lot of waiting for ingredients to cool. I ended up doubling the Chocolate Coffee Buttercream from A Baked Creation (using instant espresso instead of coffee), but the consistency was far looser than I was expecting. I probably did not wait long enough after melting the bittersweet chocolate. It tasted fine, just was a bit runny. 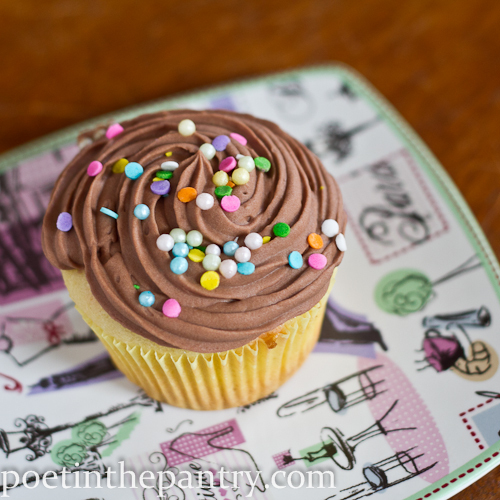 Coming out of the freezer today (where I stashed the leftover cupcakes), however, it is divine. So give the chocolate some time to cool before you add it to the rest of the ingredients or pop it in the fridge or freezer after to allow it to set some more and it’ll be fine. Preheat oven to 350 degrees Fahrenheit. Line 24 muffin cups with cupcake liners and set aside. In a medium mixing bowl, whisk together the flours, baking powder, and salt. Set aside. In the bowl of a stand-up mixer, cream the butter and sugar. Once light and fluffy, beat in the eggs, one at a time. Add the vanilla extract, blending until well-incorporated. In 3 stages, alternate mixing in the dry ingredients and milk, until fully incorporated. Mix in the candy confetti until well-distributed. 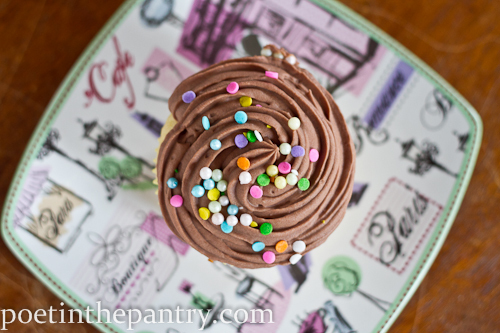 Using a large cookie scoop, fill the cupcake liners about ⅔ of the way. Bake for 17-20 minutes, turning and rotating pans halfway through the baking time. Remove when a toothpick inserted in the middle comes out clean. Let sit for a few minutes, then invert the pans over cooling racks to remove from pans. Cool completely on the cooling racks before frosting. In a microwave-safe bowl, heat the heavy cream in the microwave until it just starts to get bubbles on the edges (90 seconds or so). Mix in the espresso powder until dissolved. Add the chopped chocolate and set aside for a minute or two, then whisk until well-blended. Let it sit til it cools a bit (at least 10 minutes, preferably longer). In the bowl of a stand-up mixer, cream the butter and confectioner's sugar carefully, so as not to whip all the sugar out of the bowl initially. Add the cooled chocolate mixture, mixing until it reaches the desired consistency. Apply with a piping bag or knife. 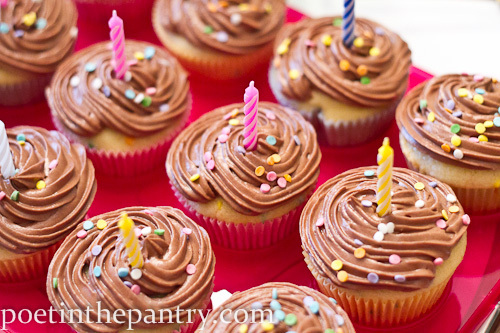 Frosting can generally be kept for at least few days in the refrigerator or a couple months in the freezer. Congrats on your top 9. Photos are beautiful! You may want to go with a little more since it won’t pack as much of a punch as the instant espresso powder. The original recipe I used called for coffee instead of espresso, though, so it should be fine. What gorgeous cupcakes!! These would be beautiful on any table. And the Espresso Buttercream, wow!! Congrats on the well deserved Top 9!